This is a rare, never before published manuscript, written circa 1880 by a long time friend and personal body-guard to Abraham Lincoln. The book was found in The Huntington Library in California in 2008. The editor, Bob O’Connor, transcribed the document and has added footnotes to identify the characters and define the 19th century legal terms used by Mr. Lamon, who was an attorney. 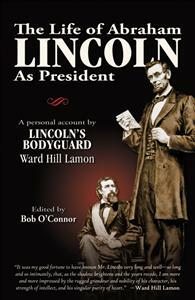 No one had as much access to Abraham Lincoln during his presidency than Ward Hill Lamon. He spent many a night sleeping outside the Lincoln bedroom on the floor to protect his friend from harm. But try as he might, Abraham Lincoln sent Lamon on assignment and went to the Ford’s Theater against his bodyguard’s advice. The rest is history.